Halloween is supposed to be a spooky day. With a few precautions you can help keep it from being a scary day. Worrying about the dangers of tricking-or-treating, carving pumpkins, and candy consumption leaves many parents anxious about the year’s most haunted holiday. Follow our steps to have an enjoyable Halloween with just the right amount of spooky. Let little kids do the scooping. Younger kids that are too young to carve will enjoy getting sticky by pulling out the innards of their pumpkin. Decorate instead of carve. Younger kids that aren’t old enough to carve can draw faces on their pumpkin with markers and/or decorate with colorful tape, paint, or accessories. Look for flame resistant costumes. Before purchase, check costume tags and ensure that all material is flame resistant. This also goes for accessories, wigs, and capes. Make your kids glow in the dark. Red Tricycle suggests a few fun ways to make Halloween costumes visible at night. Dress kids with LED accessories and glow stick jewelry such as flashing headbands, bracelets, and necklaces. Embellish costumes with iron-on reflective decals and patches. Test make-up before applying. Test out a dab of make-up a few nights before Halloween to make sure the make-up doesn’t irritate your child’s skin. Decide if your kids are mature enough to trick-or-treat without you. According to Safekids.org, children under the age of 12 should not trick-or-treat alone at night without adult supervision. But age isn’t always an indicator of a kid’s maturity level, so decide based on your kid’s attitude and sensibility if they are ready to trick-or-treat on their own. Always cross at street corners and crosswalks. Look left, right, and left again before you cross. Keep looking as you cross. When a driver stops or slows to allow you to cross the street, make eye contact to ensure that they see you. Don’t look at your phone while crossing the street. Create a route. Look at a map and create a map for your child to follow while trick-or-treating. Create a route that limits the number of times kids need to cross busy streets. Direct the route so that it crosses familiar territory and homes of known family or friends (for emergencies). Check-ins. Set times and places for check-ins. You can use MamaBear app to allow for easy, one-click check-ins or to set automatic alerts for when your kids reach certain destinations. Discuss stranger danger. Review situations that your children should avoid while trick-or-treating. Don’t approach houses that don’t have lights on. Never ever accept an invitation to go into a house, shed, haunted house, or any type of obstructed or concealed location. Make an emergency plan. Discuss safe places to stop (homes of family or friends) along the way that includes a fully charged phone battery. Give your kids a snack before they go trick-or-treating. This will make kids less likely to want to eat along the way (and combat crankiness). Tell kids to wait to dig in. Kids will want to dig into their candy while on the road, but tell them to wait. Explain to them that you need to inspect the candy before indulge. Teach them what is safe to eat. If you know your kids won’t wait, teach them to only eat sealed, commercially-wrapped candies from well-known family and friends. Teach them how to inspect the wrappers to make sure candy is safe. Portion candy and enjoy Halloween in November. Limit the amount of candy that kids can eat per day or week. Explain to them that this will let Halloween last far into November. Halloween should be an enjoyable time for spooky, family fun. 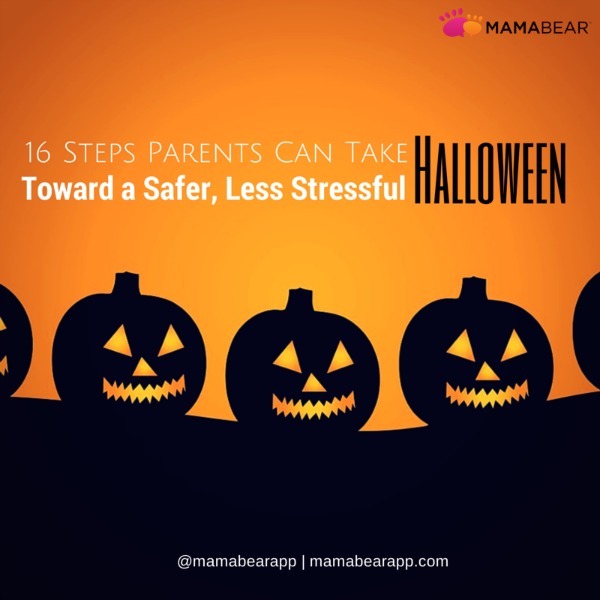 Go through these tips with your kids and use the MamaBear Family Safety app to ensure that this year’s Halloween is spooky, but never scary for parents and kids. MamaBear Family Safety app is available for both iPhone and Android devices.